Media Contact: Amanda Markow at 601-984-4878 or amarkow@umc.edu. Liz Triplett Walker has always had strong ties to the University of Mississippi Medical Center and Children's of Mississippi. She spent 13 years at UMMC as an oncology social worker, volunteers with Friends of Children's Hospital, a nonprofit organization created to benefit Batson Children's Hospital, and is a member of UMMC Candlelighters, a group that offers support for families with children undergoing cancer treatment. 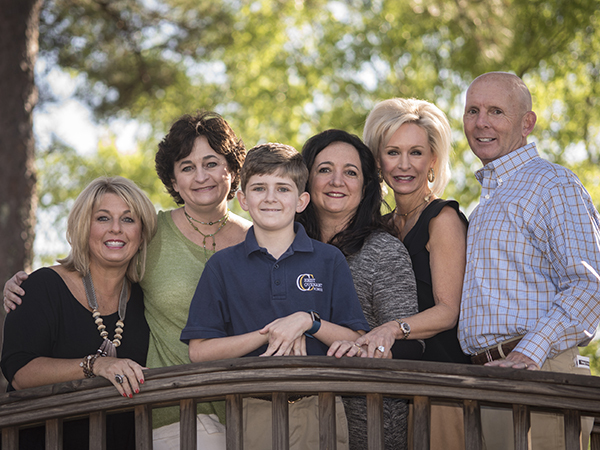 When her then-4-year-old son Felton was diagnosed with a neuromuscular disease at Batson Children's Hospital in the fall of 2010, the connection between UMMC and Walker and her four siblings became closer, and led the family to make a $1 million gift to the Campaign for Children's of Mississippi. The campaign seeks to raise $100 million in philanthropic donations to fund a portion of the project that will update and expand pediatric care at UMMC, including construction of a new neonatal intensive care unit, updating and expanding the pediatric intensive care unit, adding more operating suites, creating an imaging center just for children, and building a pediatric outpatient clinic adjacent to Batson. Felton gives a "thumbs-up" sign in front of the Batson Children's Hospital's Christmas tree while recovering from major orthopaedic surgery last December. The gift was made through the family's foundation, the Dr. and Mrs. Rodney Faser Triplett Foundation, named in honor of their parents, Faser, the first board-certified allergist in Mississippi, and his wife, Jackie. This is not the first gift the Tripletts have made to UMMC. In 2012 they helped establish the R. Faser Triplett Sr. Chair of Allergy and Immunology in honor of their father. Faser was a founding partner of the Mississippi Asthma and Allergy Clinic and served terms as president of the Mississippi State Medical Association, the UMMC Alumni Association, and the Ole Miss Alumni Association. “My parents have always instilled in us giving back and sharing when you can,” said Walker. Dr. Gailen Marshall, fifth from left, receives the R. Faser Triplett Sr. M.D. Chair of Allergy and Immunology during a 2012 ceremony at the Norman C. Nelson Student Union. 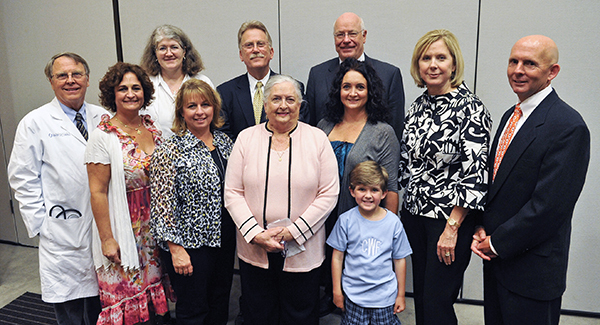 Medical Center representatives and members of the Triplett family on hand include, from left, Dr. Richard deShazo, Suzy Fuller, Dr. Shirley Schlessinger, Lou Ann Woidtke, Jackie Triplett, Dr. Jim Keeton, Liz Walker, Felton Walker, Susan Triplett and Chip Triplett. Having grown up in the area, the Tripletts have long been familiar with UMMC, and they were pleased to not only give back but also to interact with Children's of Mississippi in a new way. “The tour (of Children's of Mississippi) was great, and eye-opening. It gave an overall view of the wonderful job they do with the resources they have. But by enlarging the NICU and the pediatric critical care, it will be better for families going to see their children, and will help with some crowding issues they are currently facing,” said Triplett. Mitochondrial myopathies are a group of neuromuscular diseases caused by damages to mitochondria, the intracellular structures that produce energy. Felton now sees several specialists at UMMC, including Dr. Veda Vedanarayanan in neurology, Dr. Wade Shrader in orthopaedics, Dr. Jennifer Shores in cardiology, Dr. Phyllis Bishop in gastroenterology, Dr. Mark Reed in otolaryngology, Dr. Nils Mungan in ophthalmology, and Corinne Sampson in physical therapy, to monitor his disease. “It can affect all muscles in the whole body, but it has only affected Felton's skeletal muscles,” said Walker. There is not a cure, and he takes five medicines twice daily and will continue to monitor this for his whole life. Felton Walker, wearing jersey No. 1, was the Children's of Mississippi Kid Captain during the Egg Bowl in Oxford. The Kid Captain Program honors pediatric patients and celebrates their inspiring stories. Also on the field for the ceremony are, from left, Chip Walker, Liz Walker, and Felton's sisters Mary Faser and Elizabeth. In December, he had major orthopaedic surgery performed by Shrader that involved breaking both fibulas and tibias, rotating them and securing them with plates and screws. Felton was in a wheelchair for eight weeks before moving on to walking boots and crutches. Walker and her husband, Chip, serve on the Children's Campaign Steering Committee, which is chaired by Kathy and Joe Sanderson and is the volunteer group leading the $100 million dollar philanthropy effort. In this role, they have the opportunity to encourage other members of the community to give in support of the campaign.